Jan Svenungsson - "Descent 1-3"
left to right: "Descent 1", photo-object, 52 x 30 cm, 1995, "Descent 2", photo-object, 60 x 28 cm, 1995, "Descent 3", photo-object, 55 x 26 cm, 1995. Shown at: Galleri Ahnlund, Umeå, Sweden 1995. 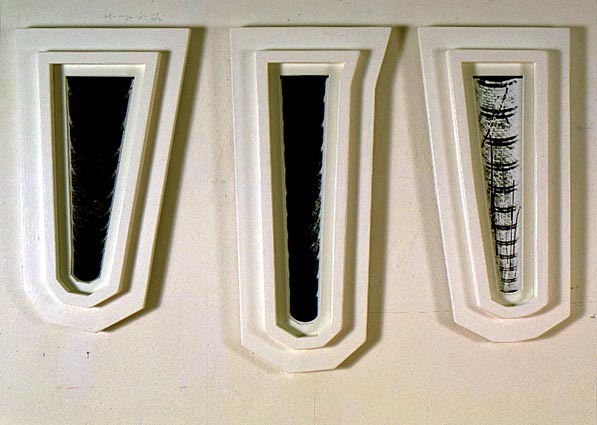 After 1992 there were very few "photo-objects" made, the frames were now painted white instead of dark brown. "Descent 1-3" were the very last.